As we enter a new year, we tend to set resolutions in an attempt to inspire self-growth and to start the year off on the right foot. My personal new year’s resolution it to eat less meat and buy my produce from local farmers markets. For me, this means eating meat that has been raised sustainably. And, as much as I can, not eating it at all. It’s not always easy to stick to resolutions, but the New Year is a great time to think about making changes and creating plans to make those changes happen. I tend to think about the beginning of the legislative session as a New Year’s resolution for states where bills are introduced by rapid fire in an attempt to steer the session down a particular path. This year, the 2018 legislative session is gearing up to be heavily focused on carbon emissions and meeting greenhouse gas reduction goals. This is important in order to remain on the trajectory to reach 80 percent carbon reduction by 2050. At the end of January, state legislators from nine states including Connecticut, Maryland, Massachusetts, New Hampshire, New York, Oregon, Rhode Island, Vermont, and Washington announced the formation of the Carbon Costs Coalition. The states in this coalition strive to tackle climate issues at the state level and join efforts to put a price on carbon dioxide emissions through shared principles. Market driven solutions and carbon pricing are key to reduce GHG emissions at a pace fast enough to prevent global warming above two degrees Celsius. 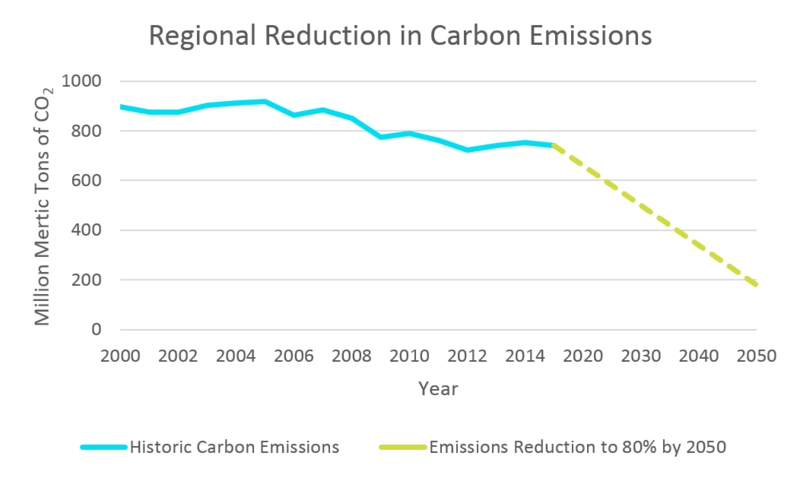 The graph below shows the level of emissions reduction still needed to reach this target. States are pulling their weight. For instance, Massachusetts senators are preparing to introduce a greenhouse gas reduction bill with carbon pricing, solar energy, and climate change adaptation measures, with plans to have an omnibus clean energy bill assembled by mid-February. An energy omnibus bill (the energy diversity bill) was also introduced in the previous legislative session and passed in 2016. This bill established the commercial Property Assessed Clean Energy (C-PACE) program, called for an energy storage target for 2020, and embraced clean energy sources to stabilize electric rates. The bill gained bipartisan support; it’s now up to the legislators to do it again and take it to the next level. Upholding its commitment to the coalition, Rhode Island legislators introduced a carbon pricing bill, H7400, which establishes a $15 fee per metric ton of CO2 on companies that sell fossil fuels in Rhode Island. This covers CO2 that would be released by burning the fuel (for consumption or distribution for all petroleum products) at the first point of sale within the state. All electricity suppliers will pay the fee on behalf of their electricity customers on the basis of each kWh used by taking the weighted average of natural gas, coal, and oil and the CO2 produced by each fuel. All fees collected will go into the energize Rhode Island fund and will not be allowed to revert to the general fund. This establishes a steady fund that will be used to decarbonize the energy system in Rhode Island. Identify opportunities by which state facilities can lead by example. This proposal will accelerate progress towards the state’s ambitious climate and clean energy goals, and bring energy efficiency to the forefront of the strategy. In addition, NYSERDA will propose the establishment of appliance efficiency standards, with support for implementation from the Clean Energy Fund. Governor Cuomo also signed into law assembly bill 6571, directing the state’s Public Service Commission to develop an Energy Storage Deployment Program, including a storage procurement target for 2030. Energy storage has been identified as an integral part of integrating energy efficiency and demand response programs to peak demand and the need for new capacity on the electric grid. In addition, senate bill 3876 was introduced in New York. This bill authorizes a study on implementing a greenhouse gas or carbon emission fee or tax and directs NYSERDA to prepare a report for the environmental conservation committees of the senate and assemble related to implementing a statewide GHG or carbon tax to reduce emissions. If it passes, NYSERDA will host two public hearings before the final report is released. New Jersey, which did not have a history as a climate action leader under the previous governor, has come to the plate. Democratic Governor Phil Murphy was sworn in as the Garden State’s 56th governor earlier this January. To uphold the promise to his constituents, he signed an executive order to rejoin the Regional Greenhouse Gas Initiative (RGGI) with the intent to grow the clean energy economy in the state. This process may take six to nine months to fully reenter due to negotiations with current RGGI states to determine the best way for New Jersey to enter into the carbon budget trading program. With New Jersey rejoining RGGI, the state will be a part of the extension of RGGI through 2030, which reduces the emissions cap by 30 percent from 2020 levels. With a new governor in town telling legislators to craft bills that encourage climate action, there has been no shortage of introductions since the start of the legislative session. Of note, senate bill 812 was introduced, which requires that, by 2050, all electric power sold in New Jersey by each electric power supplier and basic generation provider be from Class I renewable energy sources. This bill also covers the implementation of electric and gas efficiency standards. Such standards would require a reduction of electricity usage and natural gas usage for heating in the state by 2020 to a level that is 20 percent below the usage projected by the board in the absence of such a standard. While New Jersey legislators were trying to rejoin RGGI, New Hampshire attempted to leave, or at least reallocate the funds from auction proceeds. This would have been detrimental to carbon reduction and energy efficiency programs throughout the state. House Bill 592, as amended would have required all allowance sales from auction to be rebated to electric ratepayers in the state. This bill was up for vote and the House voted on January 9 to not to pass the bill as it was amended. The bill is “Inexpedient to legislate”, which means it is dead. Not passing this bill will allow energy efficiency programs to go on, which is significant because the energy efficiency resource standard (EERS) starts its initial three-year savings period from 2018-2020. The New Hampshire EERS calls for a cumulative reduction in energy use of 3.1 percent compared to 2014 statewide regulated electricity sales and 2.25 percent of 2014 statewide natural gas sales by the end of 2020. Leaving RGGI would have threatened the state’s ability to meet these targets. As a result of the 2017 legislative session, Connecticut hit a crossroad with the divergence of millions of dollars of clean energy and energy efficiency funds to the general fund. These funds are critical to programs that reduce state emissions, lower electric bills, and create local jobs. 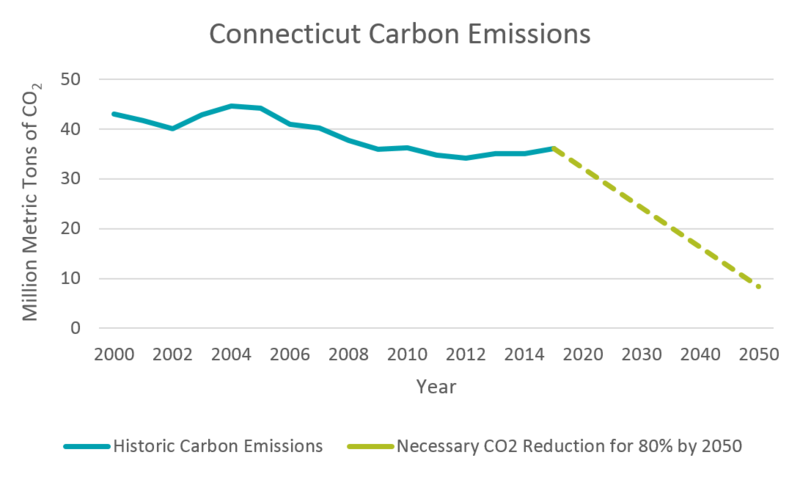 Therefore, during the 2018 legislative session Connecticut needs to commit to interim targets for greenhouse gas reduction and bolster strategic investment and asset protection of energy efficiency and clean energy. At the first 2018 meeting of the Governor’s Council on Climate Change (GC3) in mid-January, the GC3 called for 45 percent emissions reduction by 2030 as an interim goal to the 80 percent by 2050 required by the 2008 Global Warming Solutions Act. This is a step in the right direction because over the past few years carbon emissions have increased. Therefore, establishing an interim target for 2030 will help steer emissions on a downward trend. Stakeholders also encouraged the GC3 recommend increasing annual energy efficiency commitments and ensure the state is pursuing all cost-effective energy efficiency opportunities. There has also been speculation that a carbon pricing bill will be introduced this session, with the revenue being used to fill the gulf left by the budget deficit, which would uphold Connecticut’s commitment to the Carbon Costs Coalition. There is a clear trend working its way to the surface – that carbon pricing and regional collaboration is necessary to achieve state goals. Various states are starting to explore carbon pricing as a way to encourage long-term innovation through the legislature as a means to ramp up carbon reduction efforts. This will ensure the region meets its 80 percent by 2050 goal.